I have a secret: I’ve been religiously going to the Ferry Plaza Farmer’s Market every Saturday morning for… well, years. I’m sure if I ever didn’t show up for a couple of weeks in a row, one of the merchants I shop with every week would file a Missing Person’s report for me. When we’re developing recipes for the wine club, this farmer’s market is usually the inspiration for our creations. You can buy literally ANYTHING here, if it’s in season and grown within a 200 mile radius (with the exception of garlic scapes, which I’ve given up on). It seems natural that I’d name a salad after this magical place, the muse in my lifelong culinary adventure. This beautiful, seasonal salad is full of top-quality ingredients from some of my favorite Ferry Plaza Farmer’s Market vendors. The spinach is from Star Route Farms in Bolinas; the strawberries are from Dirty Girl Produce in Santa Cruz; the goat cheese is sourced from Petaluma cheese-maker Andante Dairy; the delicious crispy pancetta is from my favorite Hayes Valley butcher shop, Fatted Calf; the dressing comes from the market, too – the olive oil is from olive grower Sciabica & Sons, and the balsamic vinegar from Bariani. I’ll admit, even the sea salt used in the dressing comes from our very own San Francisco Bay. I feel very fortunate to have the bounty of California at my fingertips. These ingredients converge to create a classic salad with a little bit of an Italian twist (I am part Italian, after all). It has all of the flavor components one could wish for in a salad; herbal, sweet, savory, salty, pungent, and creamy. They are a match made in heaven, and you can elevate it to another level by pairing it with the Grace Wine Co. Santa Barbara Highlands Rosé of Grenache, available in our online store. This superbly bright and aromatic rosé is the perfect compliment to such a salad, and I can easily imagine enjoying the two together every day for the rest of my life. Heat a small skillet over medium heat and cook the diced pancetta or bacon until crisped. Drain on paper towels and set aside. 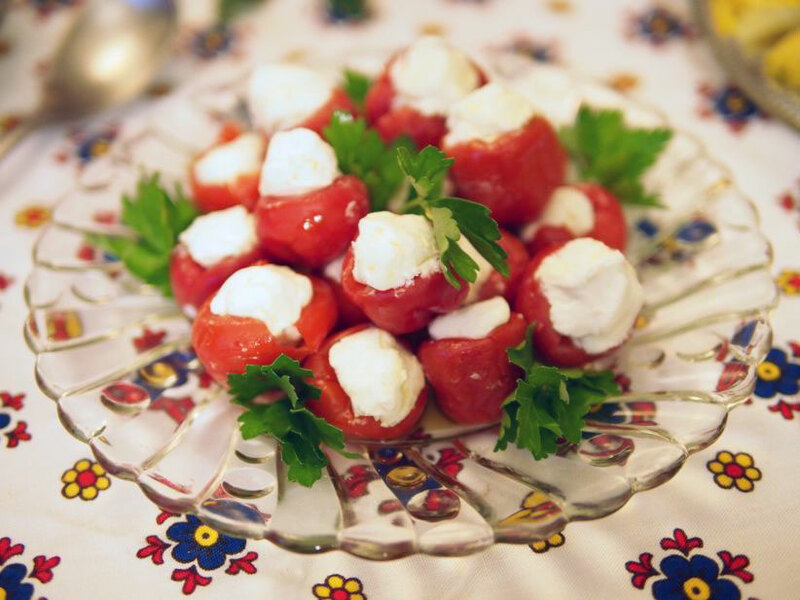 Slice the strawberries in half lengthwise, into bite-sized pieces. In a small jar, combine the olive oil, balsamic vinegar, salt, and pepper. Shake or whisk well. In a large bowl, combine the spinach and strawberries, then toss with the dressing. 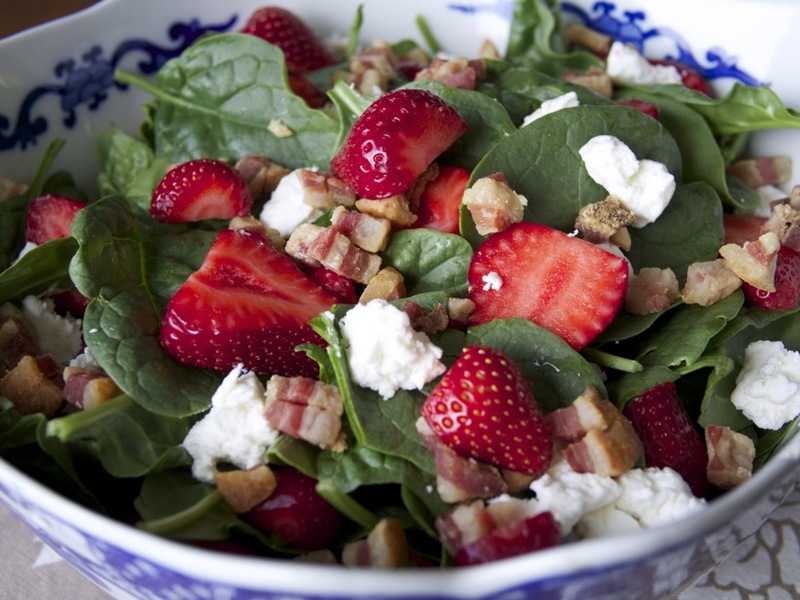 Transfer the dressed strawberries and spinach to individual bowls, and top with the crumbled goat cheese and diced pancetta or bacon. Serve alongside a tasty, fragrant rosé. Lamb is especially delicious in the spring, and this dish is meant to highlight the ingredient. The preparation is a snap, and the cook time is 10 minutes or less! 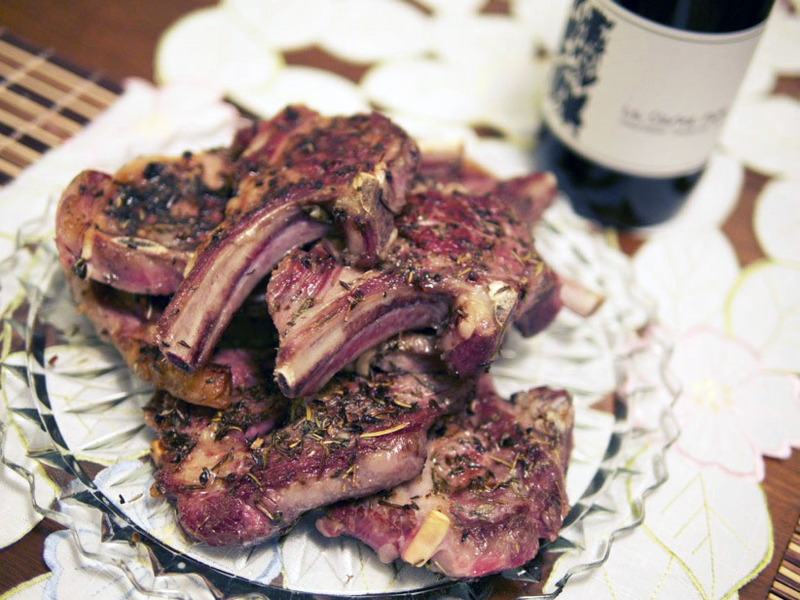 High-quality lamb chops are not inexpensive, but they impress a dinner party, or a special someone. We got ours from Olivier’s Butchery, in the Dogpatch. We highly recommend their always-fresh products – they carry poultry, beef, pork, lamb, and include a variety of both well known and lesser-known cuts. Check ‘em out! Mourvèdre is most often grown in the Provence and Rhone regions in France, and are described as having a “garrigue” quality. Garrigue is the scrub on the land in that area, similar to our chapparal in California. This dish is meant to pair with the 2012 La Clarine Farm Cedarville Mourvèdre. We use herbes de Provence, a French herb blend that evokes garrigue, as the spice on these chops. That integrates the flavor evoked by the wine into the flavor evoked by the dish, making them truly complementary. Peel, then mince the cloves of garlic. Sprinkle the salt over the garlic, then using the blade of the knife like a spatula, rub the salt into the garlic. Once the mixture resembles a paste, move the paste into a small bowl. Add the pepper, herbes de provence, and olive oil to the garlic paste and mix well. On a large plate or cutting board, lay out the chops flat. Pat dry if there is any surface moisture. Divide half the paste evenly onto the surfaces of the chops, and rub the paste to coat evenly. Flip each chop, and divide the remainder and rub to coat the other side of the chops. Set the chops aside on the counter for 30 minutes to an hour. Heat a cast iron pan or skillet on high on the stovetop for 5-10 minutes, or until it is searingly hot. Add 2-4 chops the hot pan, being careful not to crowd the pan you’re using. We did 3 at a time in a 12” skillet. After about 3 minutes, when there’s a brown crust on one side, flip the chops. Cook for 2-3 minutes longer, to achieve medium doneness. When done, move to serving plate and tent loosely with foil if you have additional chops to sear. Serve immediately. The end of the year is often a hectic time for people from all walks of life, but especially for those of us who get a kick out of entertaining and hosting. Too often we will decide to have “a few” friends over for drinks and snacks, and it quickly snowballs into something about as manageable as cooking Thanksgiving dinner for 20 people. I love to entertain, and at times I feel like it’s what I was born to do. A weird calling in life, for sure, but I really do enjoy it. I throw a lot of parties, mostly centered around food and wine. I’d like to take a moment to share with you some of the tricks I’ve learned over the years to help make entertaining as affordable and easy as possible for the gracious host, so you can spend more time with your guests. Get as much of your prep done ahead of time as possible. This is something caterers have known for ages – sometimes preparing (and freezing) ingredients weeks in advance. Many recipes will tell you what can be done ahead of time, and that combined with some common sense is a great way to get ahead of the curve. Chop all of your veggies, juice your lemons, make your salad dressings, purée your dips, mince your garlic, make your soups, and anything else you can think of the day before. Focus especially on things that are time consuming, like snapping the ends off your green beans. Find ways to make ingredients stretch and repurpose leftovers. Entertaining for a large group of people can be very costly, and nobody wants to ask their guests to chip in to help with the cost of food. Did you cook a pot of beans earlier in the week? Turn the leftovers into bean dip. That stale, day-old bread? Crostini. Last night’s risotto? Arancini. Restaurants do this, so why can’t you? My favorite trick: Go pick up some fresh pizza dough from your local grocer and make flatbreads with all the odds and ends in your refrigerator that need to be used up. Just because it’s left-over, doesn’t mean it isn’t delicious and worthy of a spot on your table. Don’t wait until the last minute to sort out your menu. Seasoned pros do a lot of planning, so if you are feeling overwhelmed it’s probably a good idea to plan everything out ahead of time. I like to use spreadsheets to keep track of the dishes I’m preparing, what ingredients I need, URLs to recipes, what I need to buy vs. what I already have in my kitchen, etc. Spreadsheets can be color-coded and are a great visual planner, and if you upload it to Google Docs you can also use it as your shopping list. It’s a good way to organize your thoughts and to prevent forgetting things like tarragon. Prepare things that are rich, filling, comforting, and inexpensive. 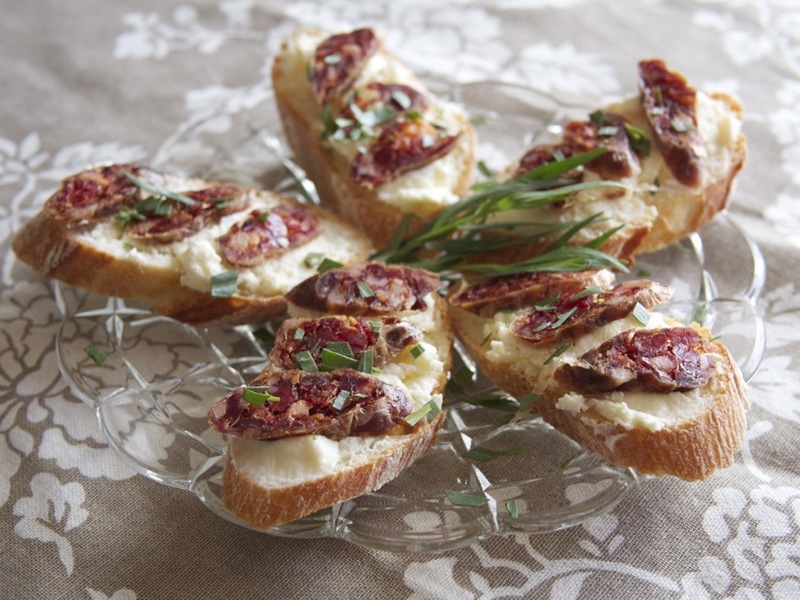 One of my favorite family-style appetizers is ricotta cheese topped with honey. The two ingredients on their own might not be especially inexpensive, but they are super rich a little goes a long way. All you have to do is plop the cheese into a bowl, cover it with honey, and serve it with bread or crackers. Another idea is to serve a fresh, sliced baguette with a side of olive oil and sea salt, like you get an Italian restaurant. Home-made hummus can be prepared ahead of time, and garbanzo beans are very inexpensive. Make a big platter of carrot sticks, celery, and other dip-worthy veggies as vehicles for your hummus or bean dip (your paleo friends will thank you!). Make a huge, healthy arugula & shaved fennel salad to cut the richness of your cheese plate. 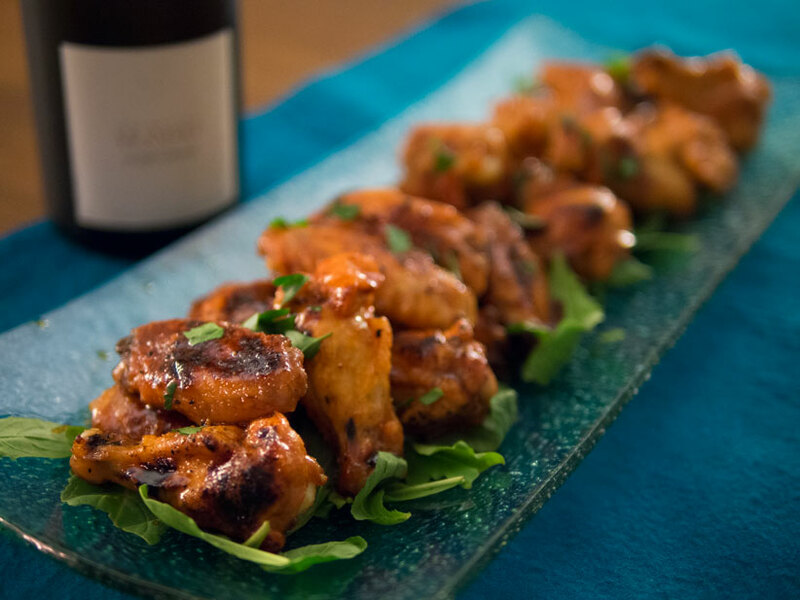 Ask your friends to help out by bringing a dish or a bottle of wine to share. It’s easy to take it all on head-first and not ask for any assistance – believe it or not, your guests are more than happy to help. If you want to deal with the food, ask your guests to help out by bringing a bottle of wine or a fancy beer. If you blew your budget on exotic wines and cocktail provisions, ask your friends to help out by bringing snacks to share. My point is, if you crowd-source your parties, your life becomes much easier. It’s way classier than asking people to chip in a few bucks as well. 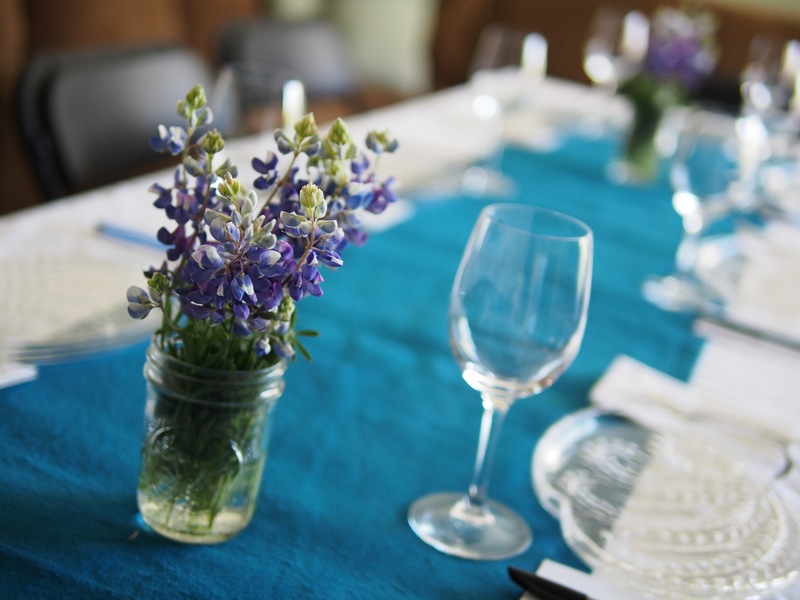 Be aware of the food allergies and dietary restrictions of your guests. I have several friends who have serious seafood, nut, and dairy allergies, along with a smattering of vegetarianism. While you don’t have to make everything nut, seafood, meat, and dairy free, it’s a good idea to make notes of what has what in it and to make sure you alert your guests if your dishes contain any food allergens. If I have a vegetarian friend coming, I ensure that nothing meat-related is touching the foods s/he can eat, and I also make sure that there is no cross-contamination during preparation. Your guests will be thankful that you went out of your way to accommodate their needs. Do you have any awesome tips for being a great host? Most of what I know, I learned from others. Share your knowledge and entertaining tips in the comments! I’ll be honest – I am not a great baker. I do bake from time to time, but I limit it to recipes that are easy to follow and hard to screw up. I am not one for rules; making precise measurements and refraining from tinkering with things is not really my style. I do, however, enjoy delicious things, so every now and then I’ll make a sacrifice and follow a recipe to the T. This is a requirement if you want to bake a cake, as explained in this video. Recently, a good friend was throwing a holiday party and I wanted to bring something to share with people and to commemorate her mom’s birthday, who was in town visiting at the time. I needed something fast, easy, and fuss-free. Perhaps I could employ that bundt pan which I have owned for a year but hadn’t used even once? 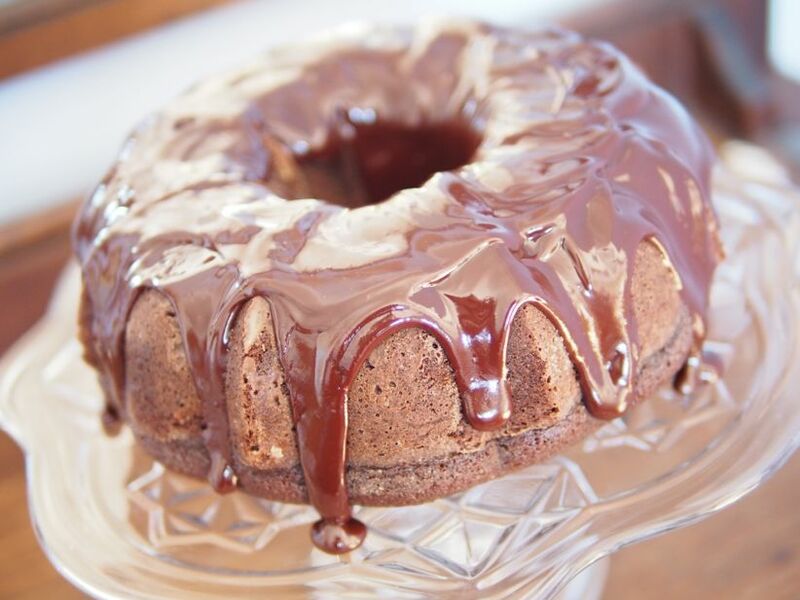 I knew my friend’s madre liked chocolate, and a quick google search for Chocolate Bundt Cake returned one of my favorite food blogs – Two Peas and their Pod. They had an intriguing looking Chocolate Sour Cream Bundt Cake recipe that looked easy to follow and hard to screw up. Perfect! The key with this cake is the quality of the chocolate you use. Do not skimp here! I used Scharffen Berger bittersweet chocolate baking chunks for the topping and Guittard Dutch Process Cocoa for the cake. Be sure to get a Dutch process cocoa, the authors of the recipe insist on it. That’s what I used and the recipe came out great. Everyone at the party loved this bundt cake, and I liked it so much I wanted a second piece. Generally speaking, cake doesn’t do much for me. This cake is the exception to that. It would be perfect for a potluck, housewarming party, birthday, or any other occasion that requires feeding cake to a lot of people quickly and easily. It’s rich, gooey, moist, perfectly sweet, and big enough to have leftovers to take home. When Tala and I were planning Secret Wine Club: Loire a few weeks ago, we had very little idea of what we were going to drink or serve up until a few days before the event. The one thing that was certain, however, was that we would pour a Muscadet, and we’d pair it with clams. This pairing is off-the-charts successful, and we both recommend you try it – but the recipe and the wine do stand on their own as well. More of a technique than a recipe, I’ll tell you what you need and what to do. Rinse your clams under cold water just to make sure there’s no debris on the outside. If you’ve bought them from a high-quality seafood shop like Hog Island, you won’t have to worry about sand on the inside, either! Start by drizzling the olive oil and melting the butter over medium heat in a saute pan with a tight-fitting lid. Once the butter is melted, add in the chopped shallot and stir with a wooden spoon or spatula until softened. You don’t want to color the shallots. When the shallots are softened, about 3-5 minutes, add in the garlic and saute for about 30 seconds. Turn the heat up to medium high, and add the wine and the water. Once the liquid is simmering in the pan, add the clams, spread in the pan evenly, and cover with the lid. Wait about 2-3 minutes, and check on the contents to see if the clams are starting to open. Give ’em a shake to redistribute. Cover and wait another 1-2 minutes. After about 5 minutes, most of the clams should have opened. If most are still closed, give them a bit more time. 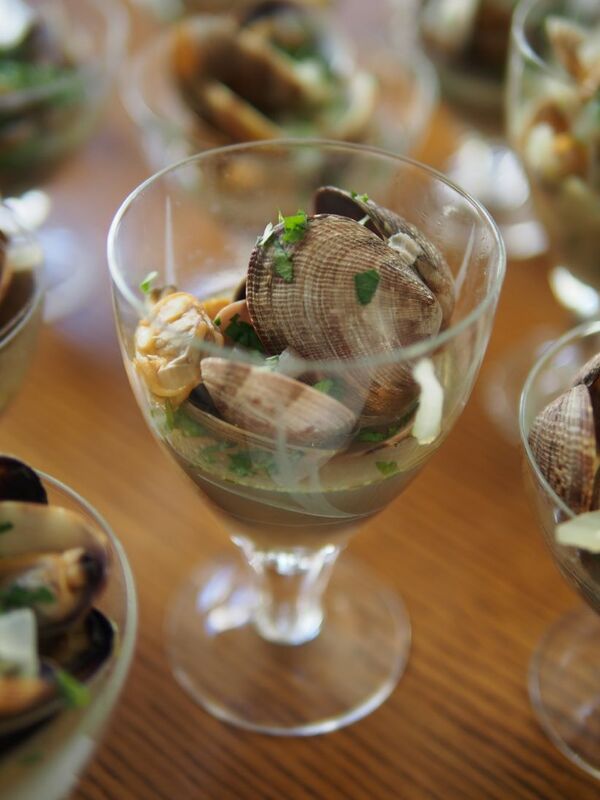 After 5-7 minutes total, turn off the heat, first transfer the clams to a serving bowl with tongs or a spoon, and then pour the pot liquor (all that delicious stuff with clam juice, wine, water, garlic, shallot, butter, and olive oil in it!) over the clams. This helps distribute the good stuff into each little clamshell, so that when you’re eating them, you don’t need to dig at the bottom of the serving bowl! 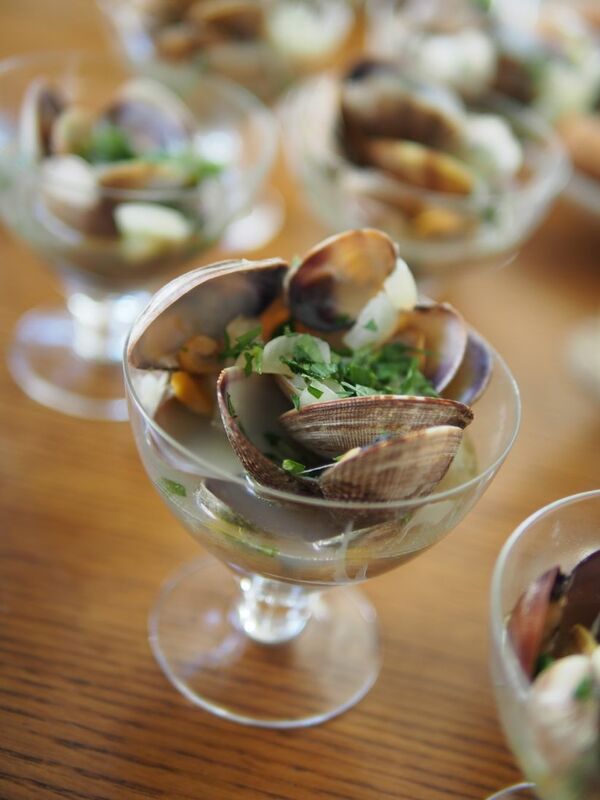 Make sure you serve the clams with an empty bowl at the table for the shells, and several slices of warm, crusty bread. Sourdough is great for this, as the tang and the sweetness and the fragrance of the clams all go together quite nicely. You can dip your bread in the pot liquor. That, my friends, is heaven. 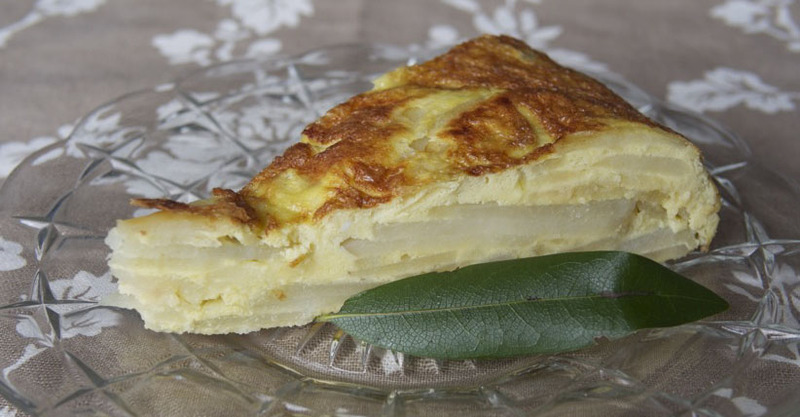 Variations: This recipe is very flexible, and very forgiving. You can use a sweet onion, or even leeks instead of shallots. You can add some cubed bacon or pancetta or crumbled chorizo to the shallots and saute until cooked through. You can swap the white wine for a nice light, crisp beer. You can use a vegetable or chicken broth instead of water, for richer flavor. Ever since I learned how easy it is, I almost never order them in restaurants, because I can make them at home in 15 minutes or less! This is one of my favorite things to eat when I’m alone, because it’s easy, fast, and delicious. Have you ever prepared clams? Maybe you were too nervous until now? Let us know! Sign up for Winelandia’s Inaugural Wine Subscription! Do you love wine? Do you find it difficult to select good wines from the vast, overwhelming walls of plonk at your local market? 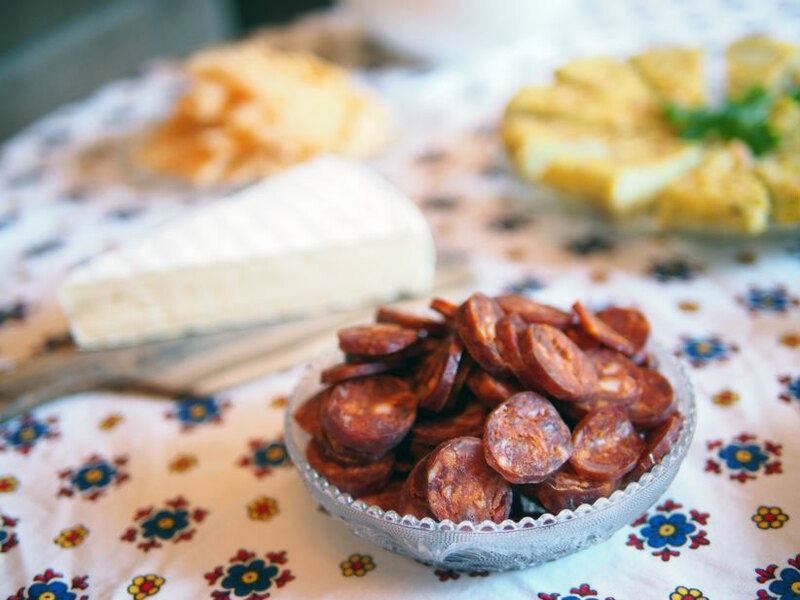 Do you have trouble picking the perfect foods to pair with that delicious wine you bought? Do you drink 2 or more bottles of wine per month? We have a solution for you! Sign up for Winelandia’s inaugural wine subscription, which will ship just in time for the holidays. We will pack and ship 6 bottles of awesome wine to your doorstep for no more than $25 a bottle. With your shipment we will include recipes, food pairing suggestions and tons of information about the wines you receive. Click the link below and join the waitlist – we have a few more slots available in our current allocation and will send you an email confirming your spot. We are looking forward to helping you impress your friends and elevate your wine-fu to a new level. Join today! It’s officially the middle of June. Spring sprung a while ago and now the days are getting longer and warmer. One of the most lovely seasonal ingredients you can find around here this time of year is fresh blueberries. They are delicious! Tart, flavorful, juicy and bite-sized. 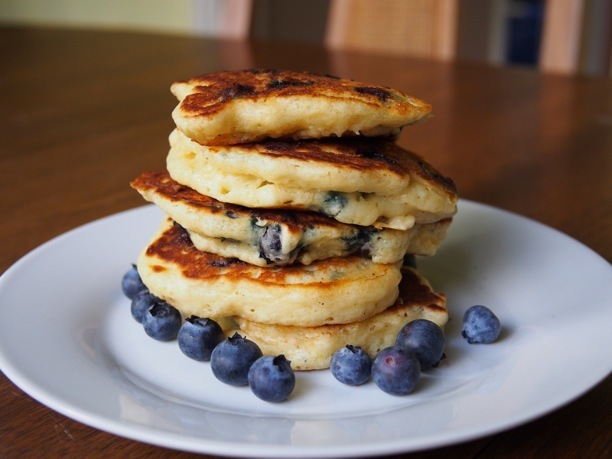 Blueberries are extremely versatile; you can add them to your oatmeal or pancakes, enjoy them with fresh ricotta cheese or hide them inside of cornmeal muffins for a delectable surprise. To top it all off, they are my favorite color – blue! I get my blueberries from a family farm at the Alemany Farmer’s Market called Hooverville Orchards. This vendor is only at the market for the summer, fall & winter seasons. They grow apples, pears, citrus, peaches, sweet cherries, sour cherries, blueberries and various other fruits. You can find them at the Alemany market from early June through February. Because they grow sour cherries, I find myself coming here starting in late May, hoping to find them on their first weekend back at the market to ask when their sour cherries will be in (more on that later). For now, we have settled for blueberries. Since Father’s Day is upon us, I thought it would be nice to cover a pancake recipe. Dads love pancakes, it’s a well-known fact. My own father used to make pancakes for us every Saturday morning while we watched the Smurfs. He wasn’t much of a cook so he used Bisquick instead of making them from scratch. I always assumed that since my father never made them from scratch then they must just be too complicated to make without a mix. How wrong I was! Pancakes are very easy to make, you just have to use a light hand, butter and medium-low heat. Anybody could make these, even kids. In a medium bowl, add the vinegar to the milk and let stand for 5 minutes while it sours. Melt the 2 tbsp. butter on the stovetop or in the microwave. Combine flour, sugar, baking powder, baking soda & salt in a medium bowl. Whisk the egg & melted butter into the soured milk. 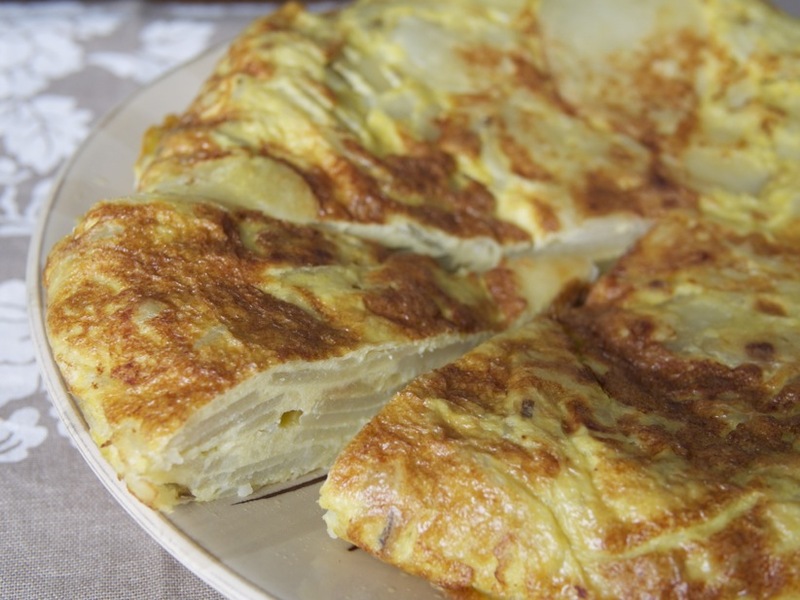 Add the wet ingredients to the dry ingredients and whisk until just barely incorporated – there should still be some small and medium lumps in the batter (this will ensure tender, fluffy pancakes!). Gently fold in the fresh blueberries. Heat a large skillet over medium-low heat. Melt enough butter to just cover the bottom of the pan. Pour batter 1/4 cup at a time onto the skillet and cook until you start to see bubbles on the surface of the pancake and the edges begin to dry. Flip the pancake and cook on the other side for 2-3 minutes, or until golden brown. Sprinkle with powdered sugar & fresh blueberries for garnish, and serve with syrup of your choice.